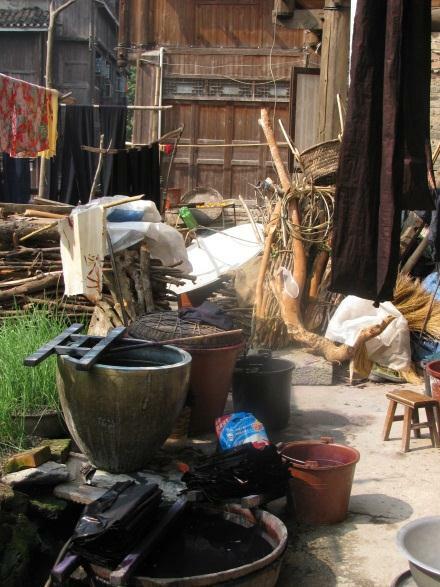 Zhaoxing is about the size of Bishop’s Castle – half way between a big village and a small town. 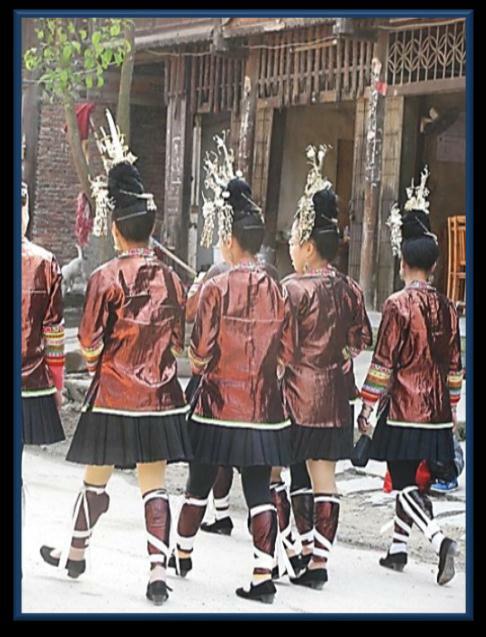 The people here belong to a clan called the Dong and are famous for their beautiful textiles, lovely architecture and great singing. 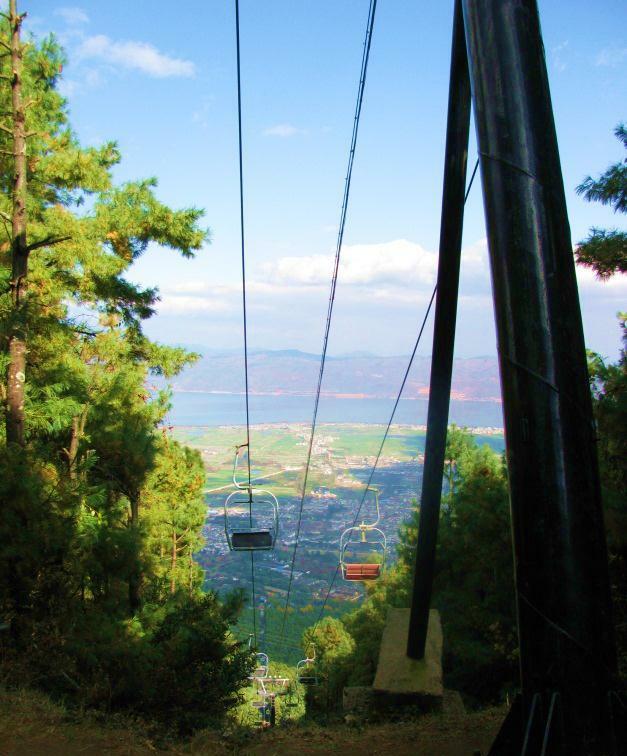 It’s almost unbelievably picturesque but also unbelievably for China – it seems real. 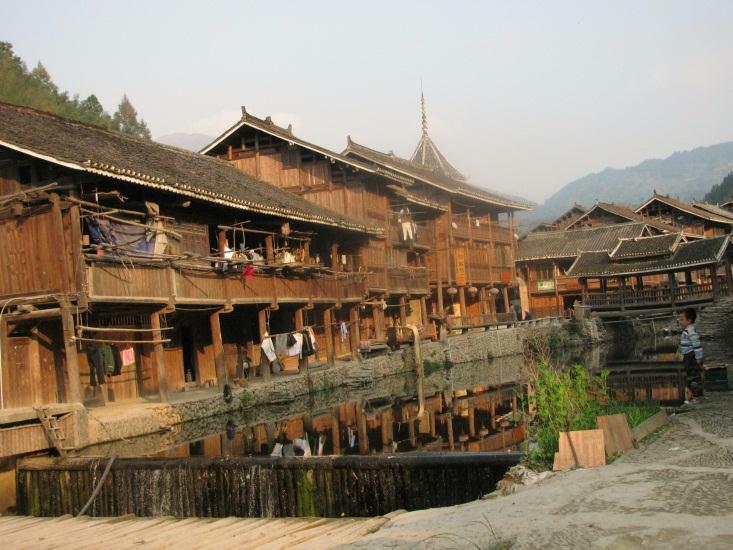 Money has been spent on preserving it but it hasn’t been tarted up to resemble a Disneyesque version of rural China – it just is one. 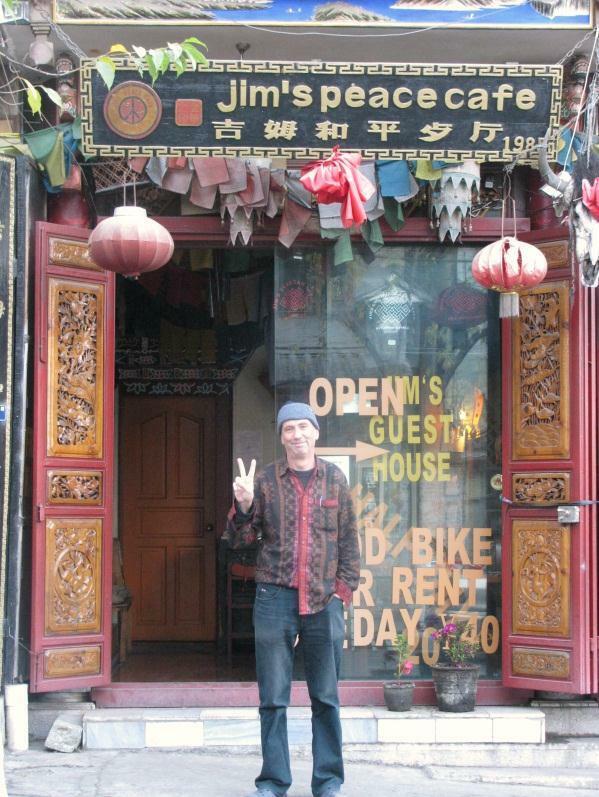 Getting here was a strange and rather surreal journey. From Kaili the bus goes straight out onto the toll way – a smooth and fast road with hardly any traffic on it for 3 hours. This expressway soars high above deep valleys on long, long flyovers – incredible feats of civil engineering. 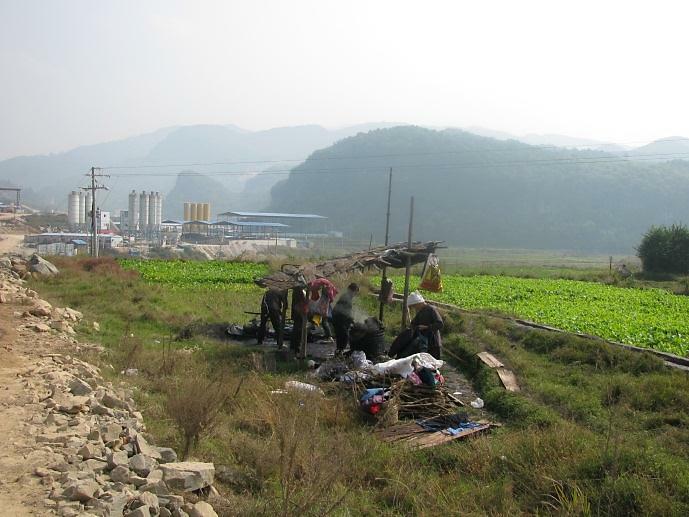 Any one of them would be something to marvel at in the UK – only this is China so we drive over at least twenty of them. Far, far below are rice fields and rivers and villages – looking down is not a good idea for anyone who doesn’t like heights. Interspersed with the flyovers are tunnels burying into the mountainsides – again at least twenty tunnels of between 1 and 3 kilometres each. It seems as if the Chinese road planners just drew a straight line on the map and built the road there, no matter what stood in its way. After one night in a crummy small town hotel we get on a country bus through villages and the expressway once again appears, but this time we are the ones below. We walk the last 7 kms with beautiful rice fields on either side of us but the detritus of the construction industry is never far away. Big apartment blocks stand on the horizon, and there are sand and gravel extraction quarries, tunnels and huge concrete flyover pillars waiting for the next road to join them up. 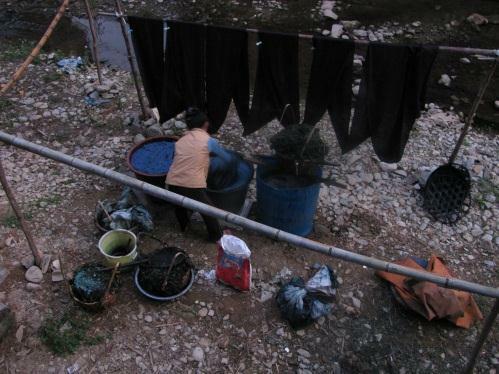 A group of women have set up their indigo vats and drying racks near a stream. Judging by the blue dyed pathway, it’s a place which they have always used. It’s a charming timeless scene (sorry to get a little sentimental) if you ignore the cement factory, flyover, and construction work in the background. Their surroundings are resolutely 21st century. It comes as quite a surprise then to walk into Zhaoxing and find that it is not full of high rise 5*hotels, and nor is it being ripped apart and put back together again only “better”. Tourism is important here (it just couldn’t get away with being this ridiculously pretty without it) but there is a real thriving community too. In fact it’s all so interesting that it’s hard to tear yourself away from gazing out from our balcony and just watching all the stuff going on. Old chaps play cards together or sit and smoke on the covered bridges, kids make mud pies and little girls play “elastic” (and to the same rules as the playground in Cov I played in the 1960s) Clothes and veggies are washed in the river and hung up to dry, bamboo is split and stripped and baskets woven, cement is mixed for building, and wood is sawn into planks, rice is threshed, you name it, it’s all going on in this incredibly industrious little place! And one thing you notice immediately in the village is the amazing amount of deep dark blue cotton lengths hanging down from almost every house. 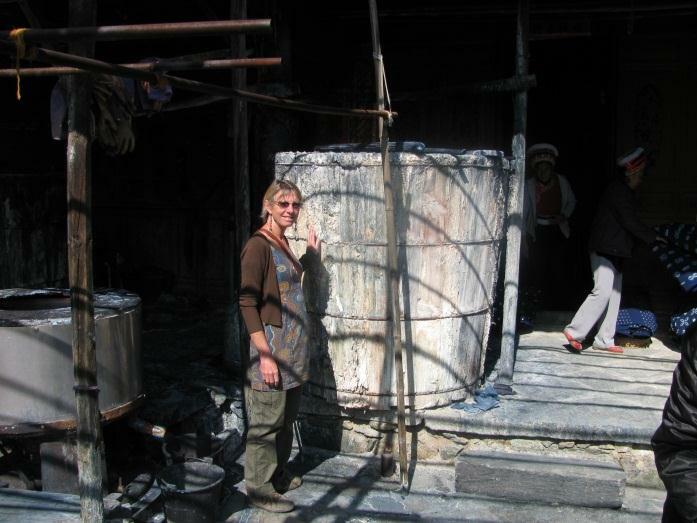 Outside almost every home there’s a wooden vat or two of indigo. Wherever you look its Indigo Central! 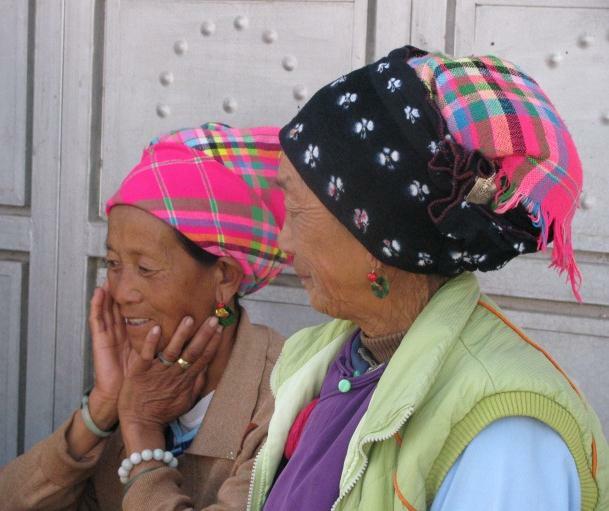 The weather is good and the rice has been harvested so the women are mostly engaged in dyeing and hammering their indigo. The sound of the big wooden hammers beating down on the folded indigo is the first sound I hear in the morning and the last at night. 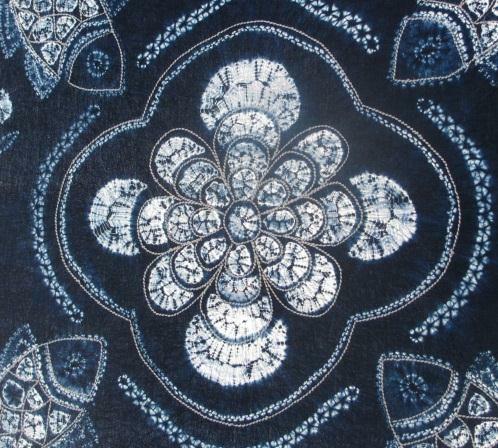 I love indigo as much as the next textile freak, but even I have to say “That’s enough ladies, thank you”. 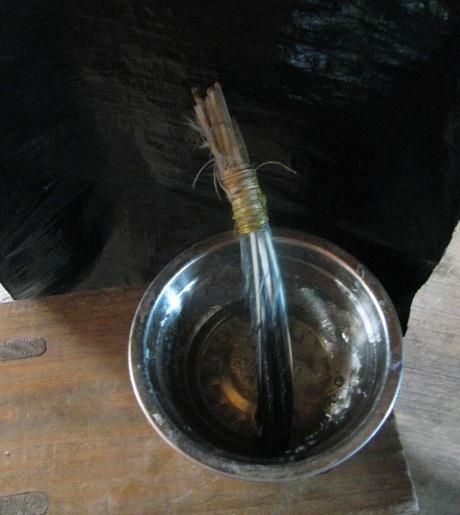 The freshly cut leaves and stalks of plants which contain indigo are steeped in a big barrel of water for a day or two. 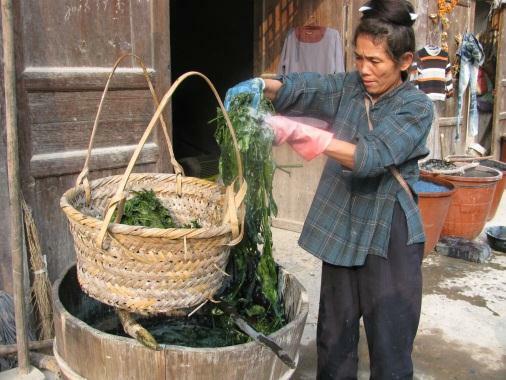 When the water turns a dirty yellowish colour, the leaves are taken out of the vat. The water is aerated by repeatedly stirring and pouring and it gradually changes to a deep blue colour and develops a nice light blue froth. The sediment from this vat makes a lovely sludgy deep blue paste which can be sold at market or kept to make a vat of dye when you need it. 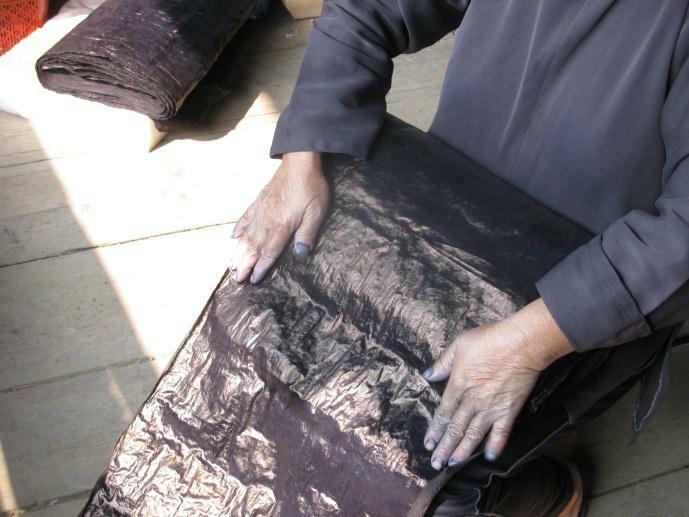 So indigo dyeing can be done throughout the year, not just when the leaves are fresh. 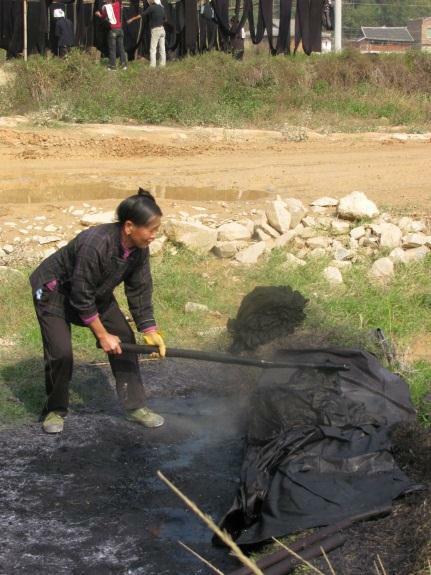 An indigo vat is usually kept on the go pretty permanently and can be revived with more paste and wood ash. 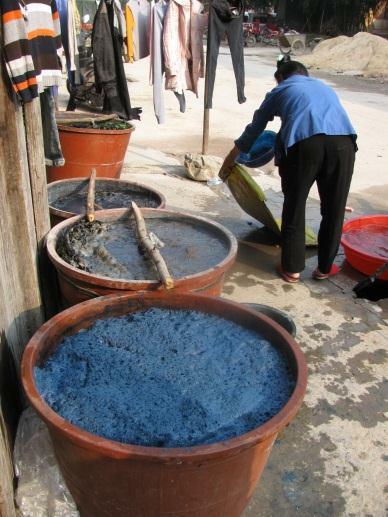 That distinctively pungent whiff is everywhere and almost every house in Zhaoxing has a vat or two of indigo outside. 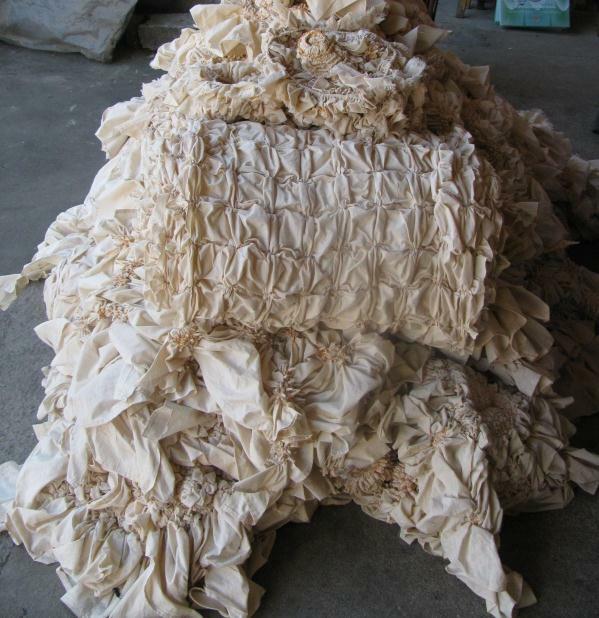 If the weather is fine, each cloth will get about 3 dips a day – and this may be repeated for up to 7 days. 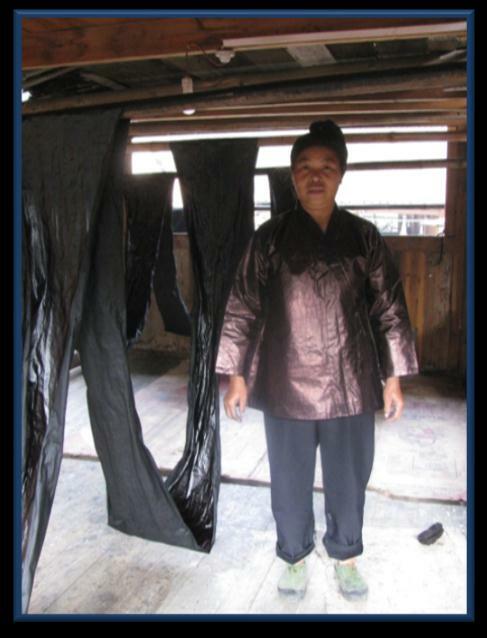 Each time the cloth comes out of the dye, i t gets beaten with a stick to allow the dye to really penetrate into the cloth. It’s then hung out to dry in between each dip and that is how you get the really deep, deep blue colour. There’s a tree root which may also be added to make the dye almost black and I’ve heard they add bull’s blood too, but cannot confirm! 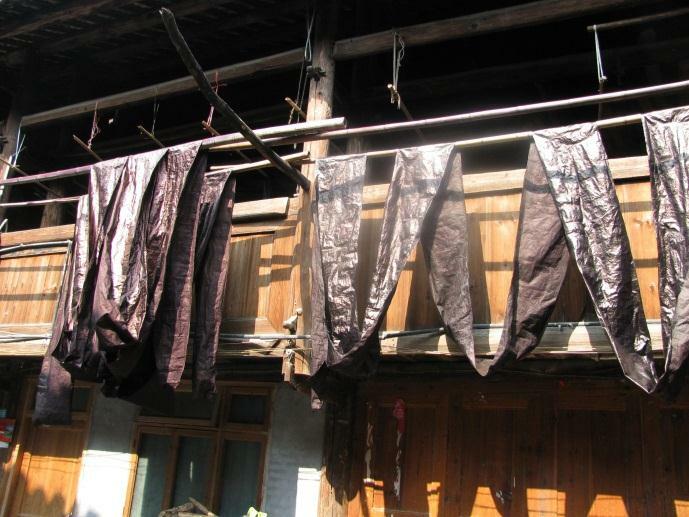 But all this is not enough for the good ladies of Zhaoxing – they want their indigo cloth to shine! So next they coat it with a sticky gluey stuff made from what looks like dried fish eggs. They do this three times and after each coat they hammer it with their incredibly heavy wooden mallets. I had a go at it – those mallets weigh about 3kgs! 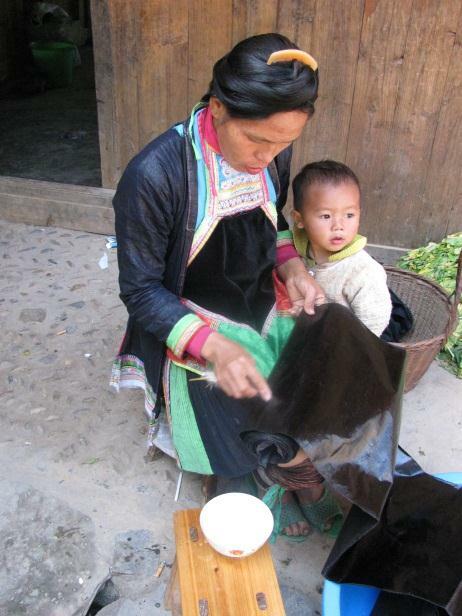 This lovely polished cloth is finally ready to be made up into jackets or the lovely finely pleated skirts the Dong and Miao women wear at festival times. 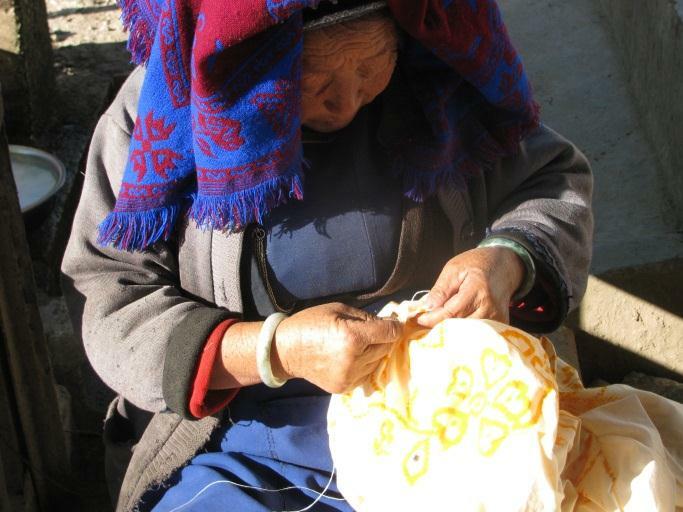 What a wonderful place and what an incredible textile tradition! 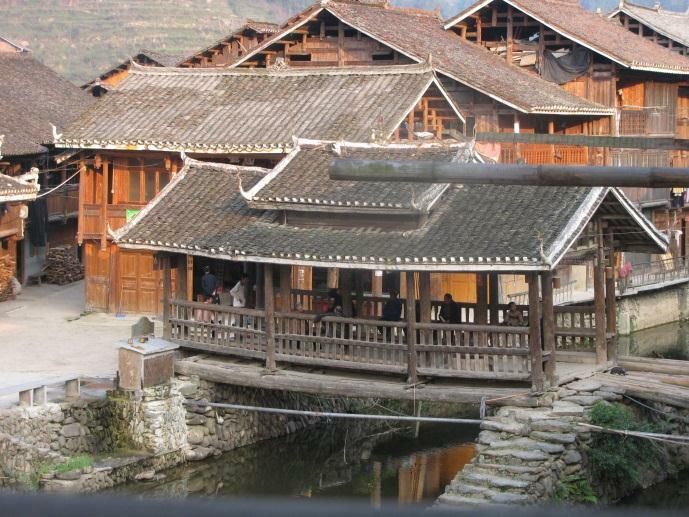 The Dong people have been living in villages like this for something like 2,000 years. 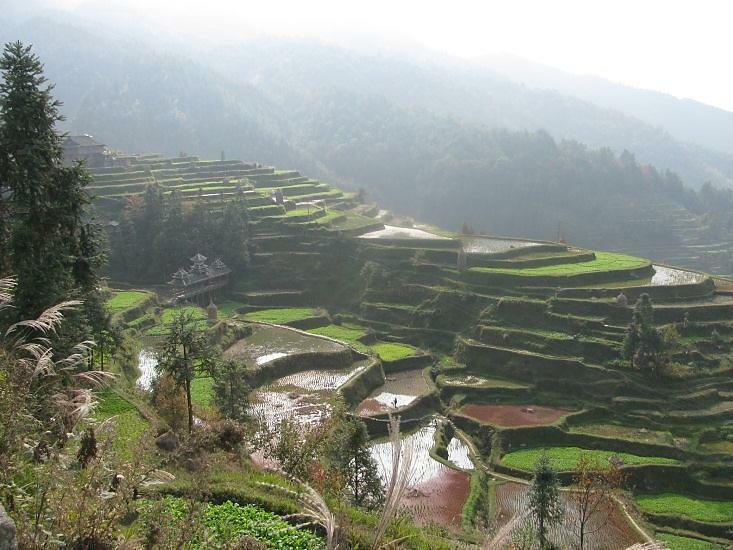 Their terraced fields cut into the mountainsides, their irrigation systems and their self-sufficient community life is beautifully adapted for this part of the world. 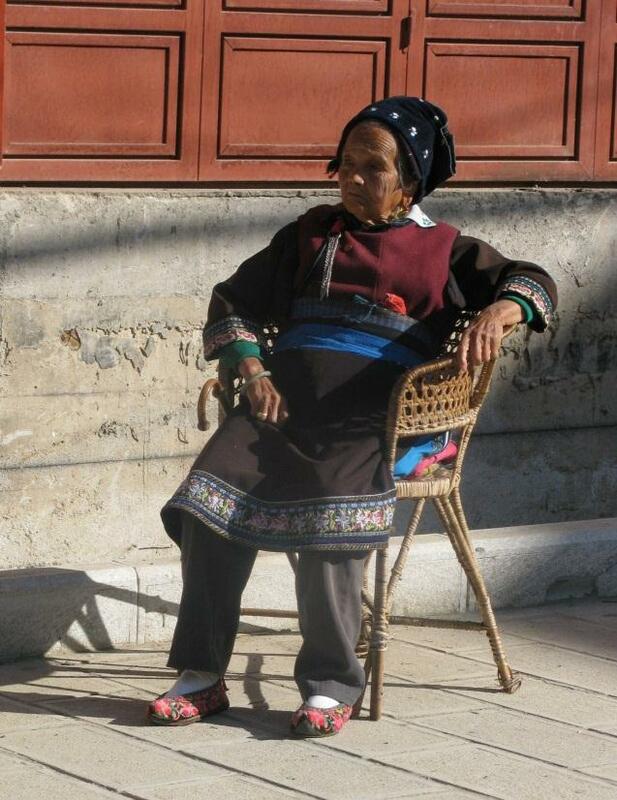 But this is 21st century China and what will happen to them in the next twenty is anybody’s guess! 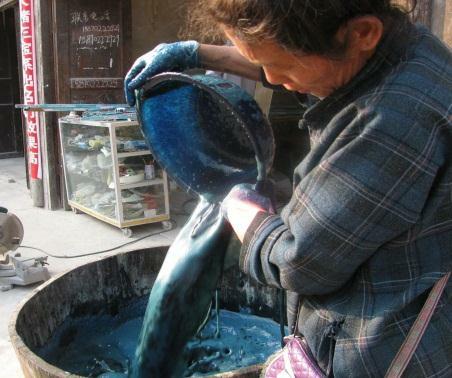 I had heard that coats of egg white are also used to waterproof the indigo but could never catch anyone actually doing it – until we went to another village (Basha) where everyone was at it! 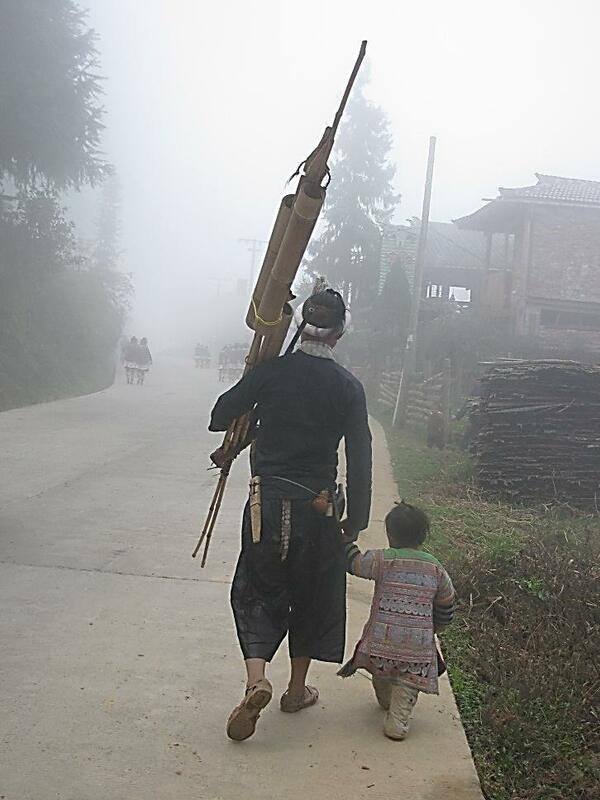 A father and young son on their way to a ceremony in the early morning mountain mists.